Discontinued products are kept here for reference. It's usually not possible to buy these, unless we come up with a deal on a used machine or two. The Lamitek PhotoSmart photo laminator has been discontinued. For a suitable replacement, please see the SM-330 13" Pouch Laminator. Lamitek PhotoSmart features quality photo lamination of up to 10mil thick and 13 inch wide. It is commercial duty, fixed speed, and has 4 heated rollers. The Lamitek SL-14 Photo Pouch Laminator has been discontinued. 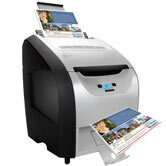 For a suitable replacement, please see the UltraPhoto 13 Photo Pouch Laminator. The Lamitek SL-14 Photo Pouch Laminator is perfect for photos, color copies, ink jet printed documents and many other tough to laminate items. The 14 inch wide, 6 roller (4 heated) SL-14 laminator is built with advanced heated roller technology for perfect lamination of the most demanding of applications. See our Pouch Laminating Machine index for a complete list of our current machine models. The HeatSeal Sprint H950 is a fully automated desktop laminating machine. It saves time and increases productivity by allowing you to load 50 documents, pressing start and automatically laminating and trimming. The HeatSeal Sprint H950 by GBC is an all in one laminating system reduces labor, time and supply costs by up to 49% or $2,500 compared to standard pouch laminators.